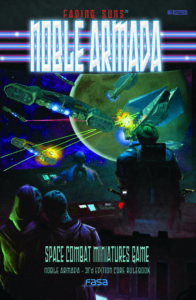 Noble Armada Rulebooks – FASA Games, Inc.
Noble Armada is a tactical, miniatures based, space fleet battle game designed to deliver a game experience that balances deep tactics with cinematic action. Players create fleets for one of the five Royal Houses from the Fading Suns setting and wage war using a ruleset that focuses on fleet command. Careful positioning of ships will enable a fleet to unleash devastating weapon barrages. Targeted attacks and flanking actions can sever lines of communication, hindering an opposing commander’s ability to issue orders to their fleet. Boarding actions allow you to capture opposing ships, and add their resources to your own fleet. All engines to flank! Raise shields! And Brace for Impact!